The 8th edition of the Africities Summit will take place between the 20 to 24 November in Marrakech, Morocco. With over 5000 participants, Africities is the United Cities and Local governments of Africa (UCLG-Africa, the African Regional Section of UCLG) flagship pan-African event that is held every three years in one of the five regions of Africa. In the framework of the Summit, UCLG will co-organize five sessions together with UCLG-Africa and CEMR-CCRE, with its committees on Culture and Social inclusion (CISDP) and in partnership with REFELA (Network of Local Elected Women of Africa), ICMPD (International Centre for Migration Policy Development) , UN-HABITAT, SIDA (Swedish International Development Agency), MC2CM (Mediterranean City-to-City Migration Project), Kingdom of Morocco, and Development Partners Network on Decentralisation and Local Governance (DeLoG), and EU Commission. Defining appropriate shared strategies in order to improve the living conditions of people at the local level. Contributing to the integration, peace and unity of Africa starting from the grassroots. With a packed programme the Summit will represent all the stakeholders of African local life as well as their partners from other regions of the world discussing topics such as housing, migration, gender equality, social inclusion and intermediary cities among others. On Tuesday 20 November, the opening ceremony will take place at 9 a.m. to open the Africities 2018 Summit. 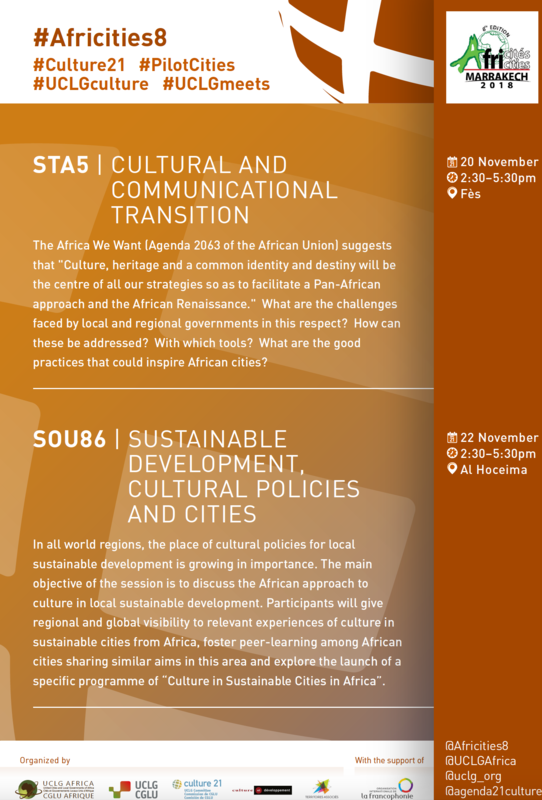 On the same day, the Committee on Culture of UCLG will organize a session on "Cultural and Communicational transition" to discuss what are the challengues faced by local and regional governments of Africa in this respect. The session will provide an opportunity to address the various challenges facing Africa and regional authorities in managing migration flows and their consequences. -9:30-12:30 Gender Equality and Social Inclusion Strategy for a Jut Transition of Africa. The event will place gender equality and women empowerment at the centre of the debate during the 8th edition of the Africities Summit. -9:30-17:30: Approach for National Strategy of Intermediary Cities in Morocco. The first workshop for the development of a National Strategy of Intermediary Cities will take place within the Summit and and this meeting will be composed of 2 parts: a consultation session with the Mayors followed in the afternoon by a scientific session. - 09:30-12:30 Localizing the SDGs in Africa. This session will highlight the state of local government engagement in Africa in Localizing the SDGs, based on preliminary results of the regional chapter of the Global Report on Decentralization and Local Democracy (GOLD V), and initiatives to build the local capacity to support the localization of SDGs in Africa. - 14:30-17:30 Leave No One Behind by Localizing the 2030 Agenda. The session aims to discuss the leave no one behind principle of the 2030 Agenda from a practitioner’s perspective to promote mutual learning and decentralized cooperation. 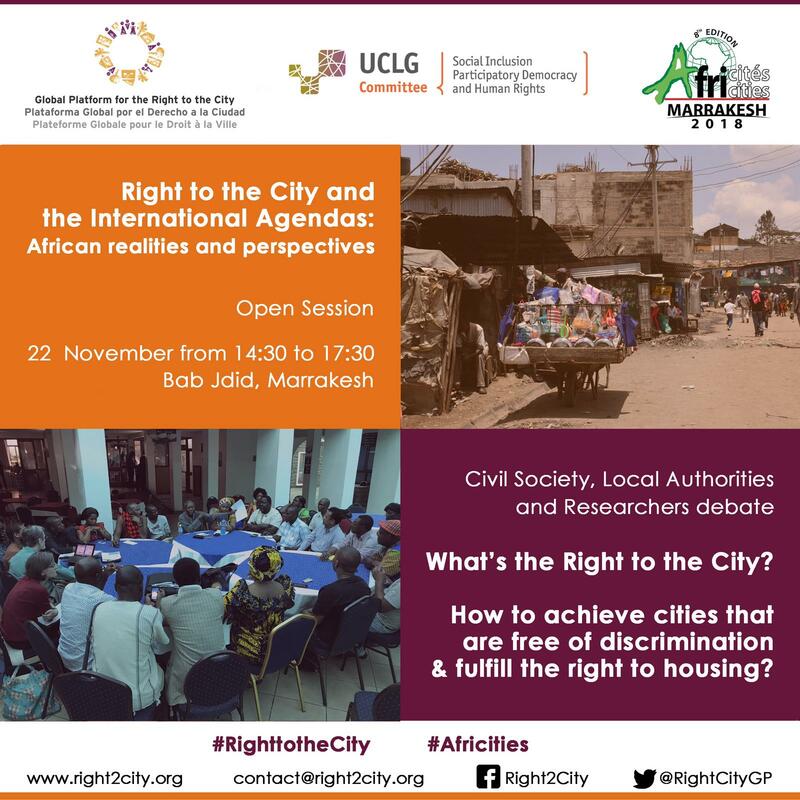 - 14:30-17:30 Right to the City and the International Agendas: African realities and perspectives. The Committee on Social Inclusion, Participatory Democracy and Human Rights (CISDP) of UCLG co-organizes with the Global Platform for the Right to the City a double meeting bringing together representatives of local governments and civil society to discuss the concept of the right to the city in an African perspective. In the first case, the debate focuses on a more general perspective: what is the right to the city for African municipalities and communities, how to implement it when we take it to the international and other global agendas. In the second the focus is on specific issues, such as discrimination, housing, gender equality or migration. On this day the Committee on Culture of UCLG will organize a session on "Sustainable Development, Cultural Policies and Cities". UCLG will manage the Global Home of Local and Regional Governments. Our team will be happy to welcome you to the Global Home, located a few steps away from the UCLG Africa stand. It will be impossible not to see us! The Global Home will serve as a platform, a workspace, and a place for presentations and networking that will ensure our visibility and coordination during Africities 8 Summit. See the completed programme here.